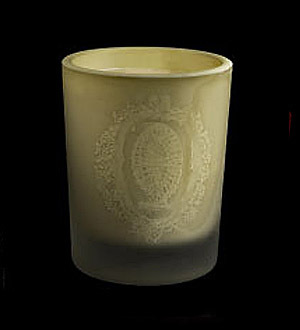 This is one of the most unusual candles we've ever encountered. We can't quite put our finger on what this reminds us of, but we keep coming back to it to figure it out. There is cotton candy and salty popcorn and sticky sweet cola. There is machinery and metal and a whiff of the sea. There is a hint of some sort of trouble and commotion. This is a lighter and sweeter fragrance when burned that you might expect from a preliminary sniff--the various scents flicker in and out instead of all being there at once. Utterly unique. 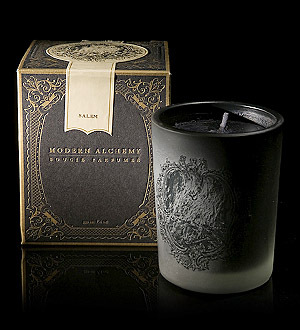 A black candle in black frosted glass named Salem. 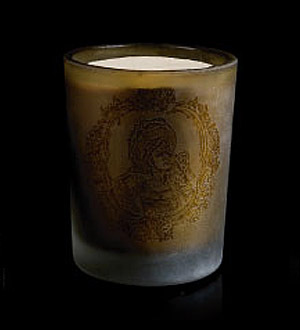 You know that you know somebody who needs this candle for its darkly beautiful aesthetic alone. It’s simply stunning. Even better, the scent is also amazing. New England maple, hickory and walnut are set on fire – and not a little fire, either. We mean a great roaring bonfire that will set your imagination ablaze. A brilliantly evocative scent that tweaks your memories of the comfort of campfires and the eeriness of the deep shadows they cast as you tell dark, dark tales around them. Luckily, we weren’t around during the time of speakeasies, because if they smelled like this we would have been in them all the time and probably would have ended up in the hoosegow. Lose yourself in the inebriating vapors of gin, pipe tobacco and wood. And if you remember that gin is distilled from juniper berries, you will not be surprised to find out that speakeasies smelled a lot like a good, old-fashioned Christmas. Yes please. These musta been made for me. I'll take one of each. seriously, it's like my heart of hearts brought these names to life. i really do want them ALL! where can they be found?